Seventh Street Books, 9781633882614, 287pp. Someone is spying on American author Helen Hancock. While in Paris to conduct research and teach a small class of writers, she discovers a spy camera hidden in her room at the Sorbonne Hotel. She notifies the US Embassy, and former FBI profiler Hugo Marston is dispatched to investigate. Almost immediately, the stakes are raised from surveillance to murder when the hotel employee who appears to be responsible for bugging Hancock’s suite is found dead. The next day, a salacious video clip explodes across the Internet, showing the author in the embrace of one of her writing students—both are naked, and nothing is left to the imagination. 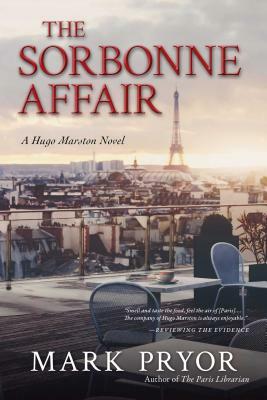 As more bodies pile up, the list of suspects narrows; but everyone at the Sorbonne Hotel has something to hide, and no one is being fully honest with Hugo. He teams up with Lieutenant Camille Lerens to solve the case, but a close call on the streets of Paris proves that he could be the killer’s next target. Mark Pryor is the author of the Hugo Marston novels The Bookseller, The Crypt Thief, The Blood Promise, The Button Man, The Reluctant Matador, and The Paris Librarian, as well as the novels Hollow Man and the forthcoming Dominic. He has also published the true-crime book As She Lay Sleeping. A native of Hertfordshire, England, he is an assistant district attorney in Austin, Texas, where he lives with his wife and three children. "Entertaining. . . . A fascinating cast, an intriguing subplot that delves into Hugo’s past, and a gorgeous Parisian setting add to the story’s appeal." "Mark Pryor is one of the best new voices in crime fiction; and Hugo Marston, one of the most appealing detectives to come along in years."